It’s natural you want a healthy and thriving lawn, however, without the experience or knowledge of proper landscape care, one can often do more harm than good. Allow our team to work on schedule to feed your grass exactly what it needs based on its type and our seasonal requirements. 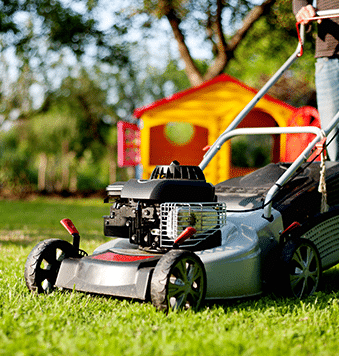 .The benefits of proper lawn care and fertilizing are many. Fertilizer promotes healthy new growth while providing the nutrients needed for grass to withstand sun, weeds and other sorts of stress. .Beautiful lawns also make going barefoot, comfortable. Kick off your shoes and enjoy a BBQ or a game of catch in a green lawn that’s bountiful and pleasant underfoot. .Our specialists understand the amounts, ingredients and the correct times to feed your yard. You don’t have to guess, or measure, nor remember when to feed. Absolute Landscaping will ensure your grass always stays green. Some might see a flower, but most of us recognize them as weeds. Hardy and resistant weeds and mosses can quickly overtake your yard and gardens, suffocating new growth while spreading like wild fire. Our weed and moss treatments seasonally improve your lawn to maintain its beauty when it’s up against a beast.